All one million and one of them, with the tiny red bodies, some speckled with white. 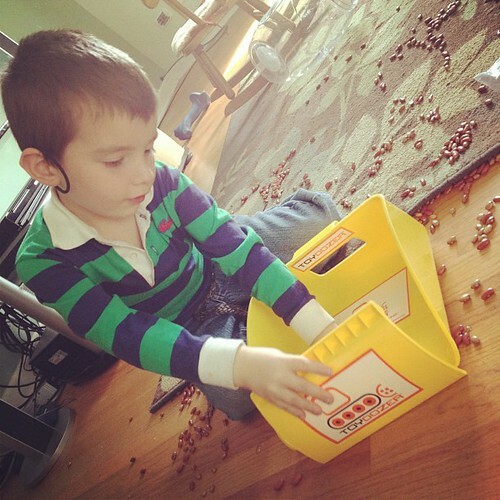 We keep said beans around because I love the hours of imaginative play that unfolds whenever I pull the container from the highest closet shelves, giving my little boys free reign to plow their cars through bean-barded highways and the green light to sink their army men into the tall mounds they've piled on the floor. But I dread the aftermath of the beans because convincing two young boys, ages 2.5 and 4.5, to clean them up is like herding cats; I end up finding piles of beans everywhere for days and weeks and sometimes months or picking them all up myself. Apparently, such is life with growing boys; as my little ones have grown older, taller, bigger, it seems that the toys they deem interesting and captivating keep dwindling in size. While those small toys are loads of fun, they are painstaking to pick up after they've been spread across the play space of the living room. Ironically, the very afternoon I received an request to review the Toydozer, a tool that aids in picking up such small pieces, I had actually spent a good chunk of time on my hands and knees wishing for such an item while picking up piece by piece all the beans scattered around the kitchen floor. * My oldest son happily uses the Toydozer as a "garbage truck" while he's scooping up all the pieces of his lincoln logs, beans or Duplo pieces instead of arguing with me for 20 minutes about cleaning up his toys. * It's simple design allows my toddler to effectively "play" with it before and during clean up. * It's sturdy and stands up to abuse at the hands of bull-dozing boys. 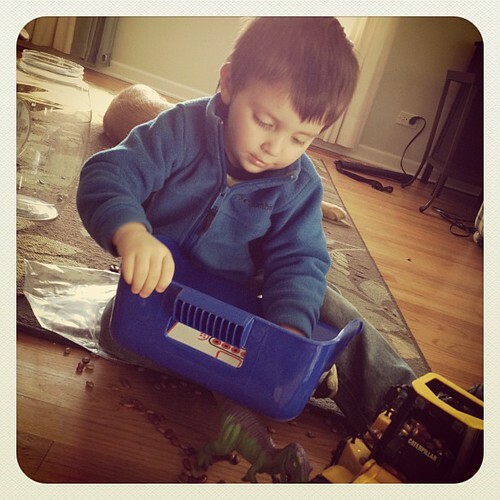 *It's not just meant for clean-up time; it's used during active imaginative play, too. * Because of its simple design, the $18.99 price tag might cause parents to reconsider the purchase. However, anyone who has picked up thousands of beans on her floor for 20-odd minutes four times during the span of a day would likely consider it a good investment. Toydozer offered to give away one dozer! Simply leave a comment sharing which of your little ones' toys most necessitate the use of the a Toydozer. If you'd like extra entries, you can like Toydozer on Facebook and follow Toydozer on Twitter. Please leave a comment for each to earn the extra entries. This post is part of a Toydozer blogger outreach campaign. Participating bloggers have been provided with a complimentaryToydozer to review and have been compensated for their time. This giveaway is open to U.S. and Canada residents 18 and older. A winner will be randomly selected Friday, April 20, 2012. All opinions expressed are my own.